What Day Of The Week Was February 23? 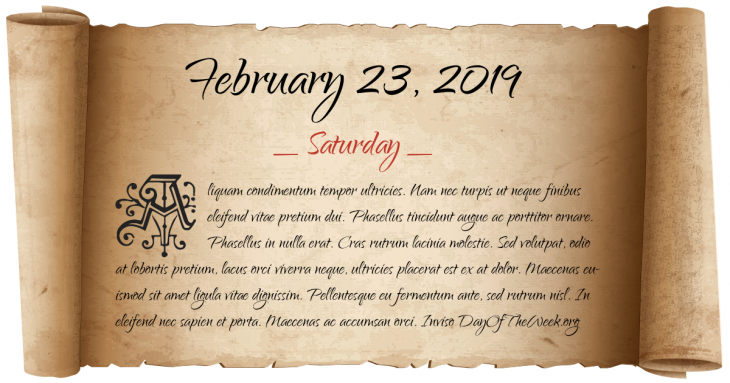 February 23, 2019 was the 54th day of the year 2019 in the Gregorian calendar. There were 311 days remaining until the end of the year. The day of the week was Saturday. Alexander Ypsilantis starts the Greek War of Independence in Iași, Wallachia, modern-day Romania. Alabama becomes the first U.S. state to enact an antitrust law. The AEA Silver Dart makes the first powered flight in Canada and the British Empire. First demonstrations in Saint Petersburg, Russia. The beginning of the February Revolution. Osama bin Laden publishes a fatwa declaring jihad against all Jews and “Crusaders”; the latter term is commonly interpreted to refer to the people of Europe and the United States. A train derails on an evening express service near Grayrigg, Cumbria, England, killing one person and injuring 22. This results in hundreds of points being checked over the UK after a few similar accidents. Who were born on February 23?